The basic chess pie or tart is made with a simple pie filling. It's similar to a regional sugar pie and custard pie and is typically made with milk or buttermilk, eggs, and butter. There are several theories as to how the name "chess pie" came about. Some think "chess" might be a variation of "cheese" (even though there is no cheese involved), while others say it's possible that it might have been named for the pie "chest" where pies were often stored. And then there's the story about the Southern housewife who, when someone asked what kind of pie it was, answered, "It's Jess's pie." 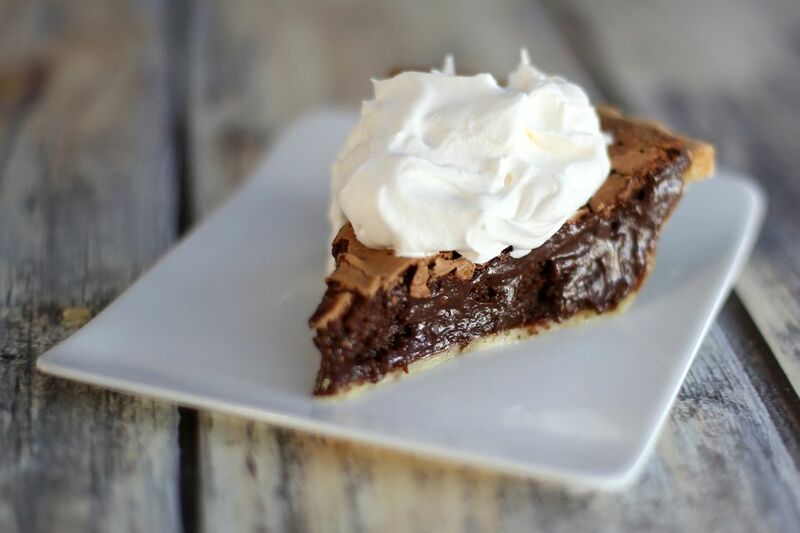 This rich, dark, and delicious chocolate chess pie is a true Southern classic. This version is made with a small amount of flour, along with unsweetened chocolate and eggs. The pictured pie was baked in a frozen, partially baked gluten-free crust, but you can use a homemade crust, a ready-made frozen crust, or a refrigerated pie pastry sheet. The pie forms a crusty top with a rich, dark chocolate filling. The flavor is brownie-like, but with the texture of a silky custard. Serve the pie with whipped topping or homemade whipped cream. Sprinkle with chocolate shavings or drizzle with a little fudge sauce for an extra-special presentation. Line the unbaked pie shell with foil or parchment paper and add pie weights or dried beans to about two-thirds full. Place the pie shell in the oven and bake it for 15 minutes. Remove the pie weights and the foil or parchment paper. Return the pie shell to the oven for about 5 minutes, or just until it begins to show a little color. Remove the pie shell to a rack and set aside. Place a heatproof bowl over a pan of simmering water. Add the butter and chocolate; stir until melted and smooth. Remove the bowl from the pan. To the melted chocolate and butter mixture, add the sugar, flour, salt, milk, eggs, and vanilla. Beat for about 5 minutes with an electric mixer. Stop and scrape the sides and bottom of the bowl with a spatula a few times. Pour the filling into the prepared pie shell. Bake at 350 F for 35 to 45 minutes, or until the filling is set. The filling will be puffed up, but it will flatten as it cools. If the pie appears to be browning too much, place a pie shield or foil ring over the edge of the pie crust. Remove the pie to a rack to cool completely. Refrigerate until thoroughly chilled before serving. Store leftovers in the refrigerator. Make sure to allow plenty of time for the pie to chill. It needs at least a few hours in the refrigerator before serving. Top it off with freshly whipped cream, chocolate whipped cream, or frozen (thawed) whipped topping.